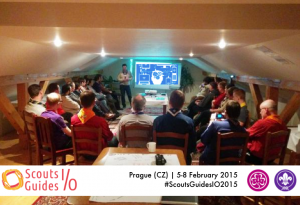 At the beginning of February 2015, the European Scouts and Guides ICT Network held its annual meeting in the city of Prague in the Czech Republic. 31 participants from National Scout Organizations (NSOs) and Member Organisations (MOs) from across the European Regions of the World Organization of the Scout Movement (WOSM) and the World Association of Girl Guides and Girl Scouts (WAGGGS) were hosted by Junák, the Czech Scouts and Guides, and spent four days discussing how NSOs and MOs could best benefit from advantages latest developments in the field of information and communication technology (ICT) offer. Many participants of Scouts & Guides I/O 2015 have responsibilities in the area of ICT in their associations as well as interest and experience in the application within Scouting and Guiding of information technology, information systems and communications and seized the opportunity to share ideas, successful practical applications and other experiences. Challenges encountered in daily practice were addressed and solutions sought during group sessions. After intensive hours spent in workshops and plenary participants were surprised to find themselves exploring the city of Prague through some entertaining and challenging recreational activities prepared by local Scouts and Guides while a visit of a local brewery and a traditional Czech dinner were highlights of the last evening. Perhaps the most important aspect of all was that the 2015 event of the Scouts and Guides ICT Network – now labelled Scouts & Guides I/O – marked the beginning of the ICT Network as an official part of the European Regions of WOSM and WAGGGS. As a consequence, a core team of network members will be working closely together and draft a strategy and plan on how the ICT network could best help the two Regions and their members in the area of applied information and communication technology. If you or your association is interested in joining the European Scouts & Guides ICT Network, just drop a line and pencil down the dates of next year’s gathering: Scouts & Guides I/O 2016 is scheduled to take place in Greece on the first weekend of February 2016.